Shatter is a hitman contracted to kill a dictator in the African country of Badawi. He completes his assignment and returns to Hong Kong to collect his fee, only to learn that he himself is the next target of the assassination because he was intended to be used as a scapegoat by his client for a larger political agenda. Being pursued by various government agencies and gangsters, Shatter seeks help from a master martial artist Tai Pah and promises to share half of his fee in exchange for Tai Pah’s protection and assistance to recovering his fee…. 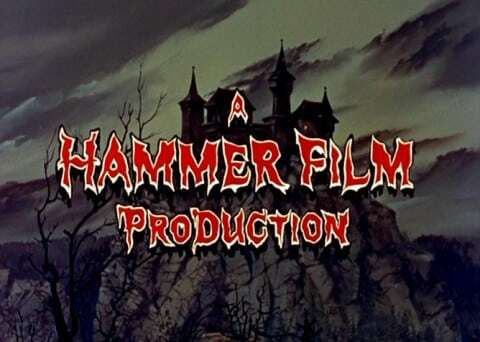 The second of Hammer’s collaborations with Shaw Brothers, made immediately after The Legend Of The 7 Golden Vampires, had an even more prolonged production. 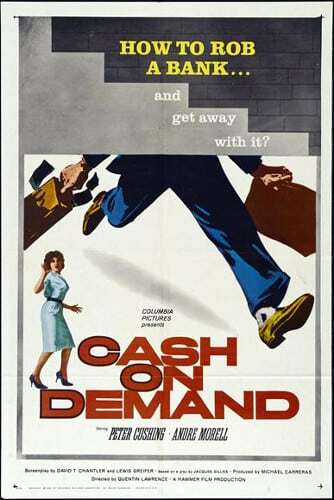 Monte Hellman was the director for three weeks until being fired by either being behind schedule, shooting “incomprehensible rushes”, or having his girlfriend do most of the directing depending on what source you read, and being replaced by Michael Carreras, while screenwriter Don Houghton was brought in to produce and was then also fired due to “creative differences”. Three different cinematographers worked on the film, while star Stuart Whitman was constantly ill, largely due to his excessive boozing. The resulting film isn’t anywhere near as uneven as you would expect, but I can’t really say that all the effort was worth it. It’s just an average action thriller with a storyline that certainly provides a few twists but which also seems to have some gaps in logic, such as why on earth Tai Pah decides to help Shatter in the first place, and has some very poorly written aspects, like the relationship between Shatter and his love interest Mai-Mee which seems to jump all over the place. Whitman, not an actor I think I’m familiar with, is a rather dull lead, not even really selling the scenes in which he seems to be brooding about stuff, though no film with both Peter Cushing and Anton Diffring in sinister roles can be a total loss and Cushing even puts on a subtle but quite effective American accent. 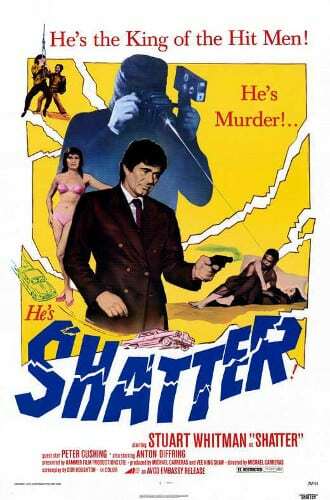 Shatter carries out his opening assassination with a bullet firing camera, but the rest of the film never rises to that level of invention, despite a few humorous moments, like Shatter eyeing up a Chinese woman in a car and a man in the car shooting at him. The fighting doesn’t come in till a third of the way through when Ti Lung, who displays some considerable charisma throughout, gets a few chances to show his skill, the best bit being him battling three goons at the end, though the fights are disappointingly brief. There’s plenty of blood on display though only a German laserdisc is uncut for some reason. The cut version sees a bad guy brandish a hook and then cuts to the same person lying dead on the ground. The none to competent Shatter delivers a few blows and fires some bullets, at one point accidently shooting Ti Lung in the arm, though this is not remarked on. 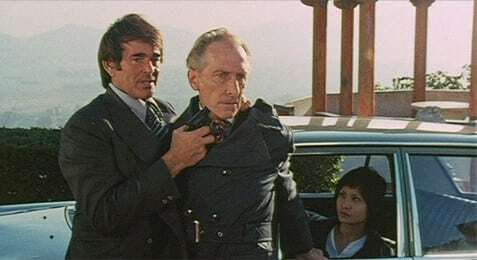 It’s all quite limited, fails to build in an exciting manner, and is almost entirely lacking in the silly panache of The Legend Of The 7 Golden Vampires, despite a fun Blaxploitation-style score by David Lindop which replaced the supposedly terrible Chinese effort. Shatter was intended to lead to a TV series, and indeed it feels like a more violent-than-normal TV pilot. 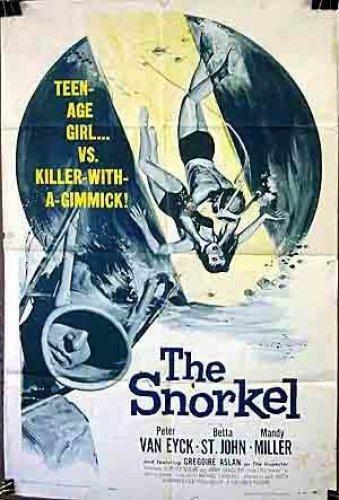 Certainly watchable, but not as much fun as it sounds.